I've been impressed by the quality of research done on this forum. I have "drunk driver" meaning one who drives an automobile while intoxicated from 1948. I'm pretty sure it's older than that. Can anyone find an earliest attested date of that phrase in that sense, with evidence showing it in a reproduction (i.e. digital scan, not transcription) of a dated publication? And would there be an objection if I drop such queries here from time to time? 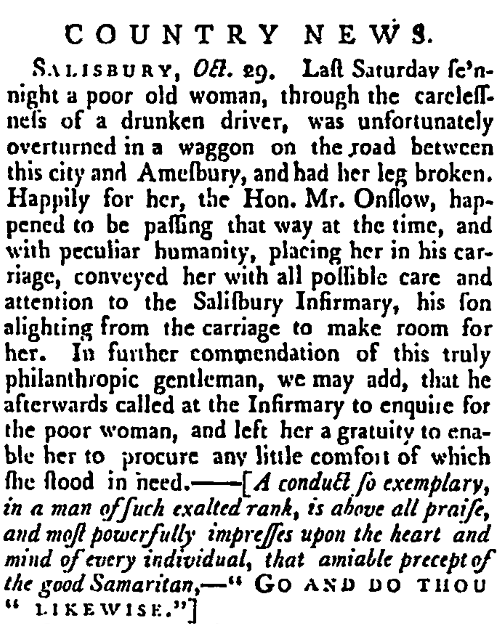 I have this dated 1787, culled from the online Felix Farley's Bristol Journal (Bristol, England), Saturday, November 3, 1787; Issue 2036. 17th-18th Century Burney Collection Newspapers [accessed 2018-12-11]. A Drunk Driver.—Charles Hillman was charged with having been drunk while in charge of a horse and cart in Hay-street. The accused, it was stated, was sent out in the morning by his employer, Mr, Gullen, to deliver a round with a baker's cart. He, however, got hopelessly intoxicated, and neglected his master's property and business. The accused was sentenced to 21 days' hard labor. There is one magistrate in England at least who thinks some of the laws require revising and bringing up to date. For instance he considered he should have greater power for dealing with drivers of motor cars who have indulged too much in the cup that cheers, but also inebriates. While dealing with a case the other day he complained that "It is ridiculous that I can only fine the drunk driver of a deadly thing like a motor car the same as a drunk driver of a donkey cart." To see the original articles from which these excerpts came, simply click the linked article names. As to the expenditure of constitution, that or the risk of a broken neck is not to be expected to be thought of, by a being, who imagines he exalts himself in the world's opinion, by suffering a drunken driver to extort money from him at every stage, under penalty of being insulted with foul language, (yet knows the fellow is amply remunerated for his services by the coach-owner;) and as often repels the travelling vagrant on foot with that harshness and unfeeling pride, that brings the blush of indignation from the wounded heart. This is the same instance that Hot Licks identifies as "Drunken driver from 1815." Our elegant researches carried us out of the highroad and through a labyrinth of intricate lanes, which seem made on purpose to afford strangers the full benefit of a dark night and a drunk driver, in order to visit Gill's Hill, in Hertfordshire, famous for the murder of Mr. Weare. On Saturday night, the Leeds True Briton coach, was overturned coming from Leicester, through the carelessness of a drunken driver, who turned it out of the road where no impediment existed to interrupt his progress. There were five inside passengers and several outside, all [?] of whom were much hurt. These three instances, of course, involve drivers of horse-drawn conveyances. The earliest example the OED has of drunk-driver is from 1948. They do however have a US example of drunk-driving from 1937. 937 Literary Digest 30 Oct. 8/1 In view of the rise in accidents from this cause, we will concentrate on just one thing—drunk driving. The Pennsylvania Railroad Company...took measures recently to ascertain which of its thousands of employees are in the habit of using intoxicating liquors and they have seen to it that all such men are taken from places in which they may endanger the safety of trains...The great railroad does not trust a man who drinks. Some years ago the great Santa Fe system began to discourage drinking by refusing to employ men who were moderate drinkers. The officials realized that what the man calls a moderate amount of stimulant may so affect his brain that he is no longer to be trusted. A great eastern paper, in a recent issue makes a bitter complaint of the automobile because it is used by men who muddle their brains with drink and then become unsafe as drivers...When [a] drunk driver comes along better take to the fence corner and pray that he doesn't find you. Not the answer you're looking for? Browse other questions tagged etymology dates or ask your own question. What is the origin of the term “back to back”, meaning to follow one after the other? Why is “back-” used in “back-order”? What am I implying with the expression: “Let's meet so we can get a better feel for each other” in a dating context? Can Dating Be Used In Non-Romantic Situations?